When wearing a brace fixed or a removable it is very important that high levels of oral hygiene are maintained. Food and plaque collects around the brace, and commonly along the gum margins. If this is not removed it can result in swollen, bleeding gums and stained or decayed teeth. 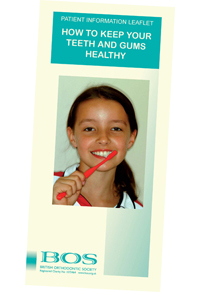 Poor tooth brushing and too many sugary foods can lead to white or brown marks on your teeth when the braces come off. These do not polish off and may even require treatment from your general dentist. If your gums begin to bleed whilst brushing it shows you have not been brushing thoroughly and you should start to brush them more not less. It is very important that all patients undergoing orthodontic treatment continue to see their regular dentist for general check-ups, as they look at different aspects of your dental health.